Click HERE for more pictures from the bicentennial event on our flickr site! 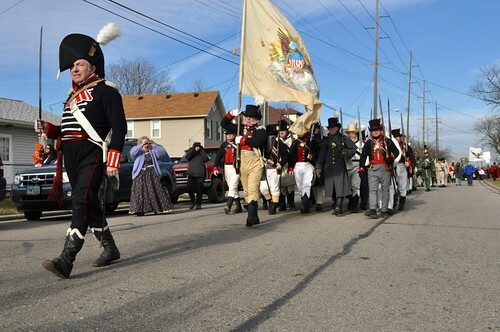 MONROE, Mich.—Re-enactors depicting the War of 1812, select Kentucky Guardsmen and Canadian dignitaries met to commemorate the 200th anniversary of the Battle of the River Raisin in Monroe, Mich., Jan. 19. Kentucky National Guard Adjutant General Maj. Gen. Edward W. Tonini, State Command Sgt. Maj. Greg Armstrong, Capt. 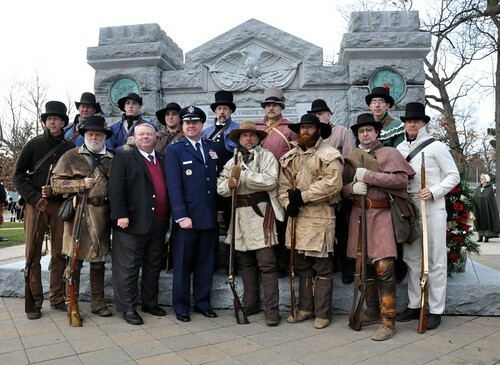 Jake McKinney and KYNG historian John Trowbridge were invited to take part in the bicentennial celebration and honor the service and sacrifices of the Kentucky Militia. Seven years in the making with more than 300 re-enactors from around the United States and Canada participated in the commemorative activities at the national battlefield and included tactical demonstrations, patriotic tributes and celebrations of peace. A wreath presentation was held at a Kentucky Memorial in downtown Monroe with Tonini and Consul General of Canada Dr. Roy B. Norton to honor the fallen Kentucky militiamen who died in the Battle of the River Raisin. A total of 25,010 Kentuckians fought in the War of 1812 with more than 400 killed in action at the River Raisin. Over the past 200 years, the citizens of Monroe and the state of Michigan have established monuments and historical markers to commemorate and preserve what occurred there for generations. “The monument where we stood today was established nearly 109 years ago,” Tonini said. “This is perfect in keeping with the time honored military axiom of ‘no Soldier left behind’,” he said. Tonini also said he has a terrific historian in John Trowbridge who is a wealth of knowledge of this particular era and Kentucky’s involvement in this war. Trowbridge has been traveling to Monoroe for the past 10 years and said each time he visits, he’s more impressed with the community. “They do such a great preservation of our Kentucky folk,” Trowbridge said. “They ask for nothing in return and it makes me feel really proud,” he said. Trowbridge not only appreciates what the community of Monroe does for Kentucky, he continues to influence and maintain the partnership between Kentucky and Michigan. One significant event Trowbridge contributed to was back in 2004 when he realized they were approaching the 100th anniversary of establishing the Kentucky Memorial. Trowbridge contacted the local officials of Michigan and asked if they were doing anything in honor of the historic centennial. Originally they had not planned anything but after speaking with Trowbridge, the town of Monroe decided to establish a permanent flag pole at the memorial to fly Kentucky flag to honor their fallen presented to the city by former Adjutant General of Kentucky Norman E. Arflack. Not to be left out of the celebration was Dr. Norton, who represents Canada in Michigan, Ohio, Indiana and Kentucky. Norton said because of the War of 1812, our two countries are now built on a foundation of enduring peace. The Adjutant General of Kentucky Maj. Gen. Edward W. Tonini, Dr. Roy B. Norton, Consul General of Canada, and State Command Sgt. 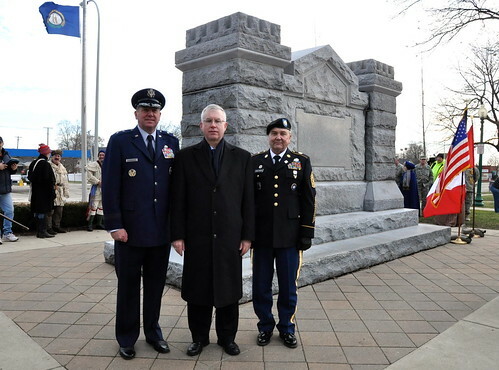 Maj. Greg Armstrong stand at the Kentucky Memorial, established in 1904 to honor the fallen Soldiers of the Kentucky militia during the War of 1812 in Monroe, Mich., Jan 19. Trowbridge has been following the trail of the Kentucky Militia and their involvement in the War of 1812 for the past year. He made visits to Canada, Michigan and will conclude the bicentennial commemoration in New Orleans this weekend where the British were finally defeated after a 45-minute battle.